Get invigorated this summer by enjoying a segment of the Appalachian Trail. Even if you don’t ever plan on hiking the full 2,180 miles through 14 states from Georgia to Maine, you can, at least for a few hours, embrace the beauty and serenity of the trail. But, as you set foot on the “A.T.” you might not be able to stop yourself from entertaining a quick daydream about simply continuing along the serene, natural trail until you reach the end. Virginia’s beauty is showcased along its 550 miles of the A.T. — the most of any state—and one of the two hikes featured here takes you briefly into WV, which is home to only 4 miles of the A.T. trail system—the least of any state. Our two featured hikes offer amazing views and pristine wilderness. Bear’s Den is a shorter hike summiting a gorgeous rock outcropping that offers great opportunity for exploration and is a lovely picnic spot. Raven Rocks is a longer hike that weaves past streams and through tall trees then peaks at a lovely, rocky overlook and, if you are lucky, you may get to walk below rock climbers making grand ascents. Both hikes are accessible from the same parking areas. There are two locations along Route 7 near the intersection of 601. There is the main lot on Pine Grove Road, off Route 7, and an overflow lot just a few yards off on the other side of the road directly at the intersection of Route 601. Bear’s Den. The first hike, called Bear’s Den, is most easily accessible from the overflow lot as it is on the same side of Route 7. Once parked, you can head directly into the woods and follow the well-marked, white-blazed trail. The trail includes “stairs”/rocks to help with ascents. The trail meanders through a lovely rock-infused spot that just begs for a photo. There are also a few forks in the road. At the first one, there is a large sign indicating A. T. N. and A. T. S.; follow A. T. S. to reach the rocks. At the second fork, there are signs to the Bear’s Den Trail Center. Ascending this trail leads to a privy and a lodge. The old stone lodge and stone entrance are worth the short climb up the trail. 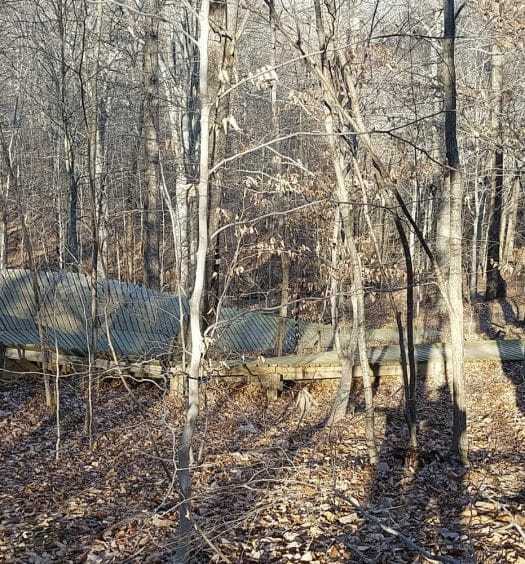 There are benches and campsites at this location as well. Head back down and continue less than a ¼ mile to the large rock outcrops and enjoy the views. The total hike out and back is 1.1 miles (less than 1 hour) and offers great views, exploring opportunities and a fun hangout spot. Raven Rocks. The second hike, Raven Rocks, is a 5.5-mile hike (about 4 hours): 2.7 miles out and then back another 2.7 miles. It is more easily accessible from the main parking lot off Pine Grove Road; however there are only about 20 spaces for cars and parking on Route 7 is strictly prohibited. Raven Rocks is part of a 13-mile segment of the A.T. known as “Roller Coaster,” and it lives up to its name. It has three invigorating ascents along its path totaling a 1,530-feet vertical climb. It is a popular segment of the trail, and you will likely see many other hikers along your route. The trail starts with a brief uphill then a fairly long descent, which is just a warm up for the next three roller coasters. The trail is well blazed with white markers and it crosses small creeks and rocky streams in three locations. The peacefulness of the trail and the forest overtakes you immediately; the roadway is almost immediately unseen and unheard. The trails are even more impressive knowing that they were completed in 1985 and that previously most of the Virginia segment of the A.T. ran along interstates and highways. After passing through Raven Rocks Hollow Creek, you are just a short ascent from the WV/VA line marker along the trail. Once past that marker, Raven Rocks are just a short distance ahead. After enjoying the breathtaking views, look for a glimpse of rock climbers scaling the 100-foot face of Raven Rocks, which is a popular climbing destination. The rocks also offer a great picnic location for a refueling lunch before heading back 2.7 miles to the parking area – or who knows, maybe you’ll be so entranced you’ll continue on to Georgia and attempt to join the roughly 2,000 other hikers who complete the A.T. from start to finish each year. Both hikes can be completed in the same day. If you head out early you can also take in a sweet reward after your hike. 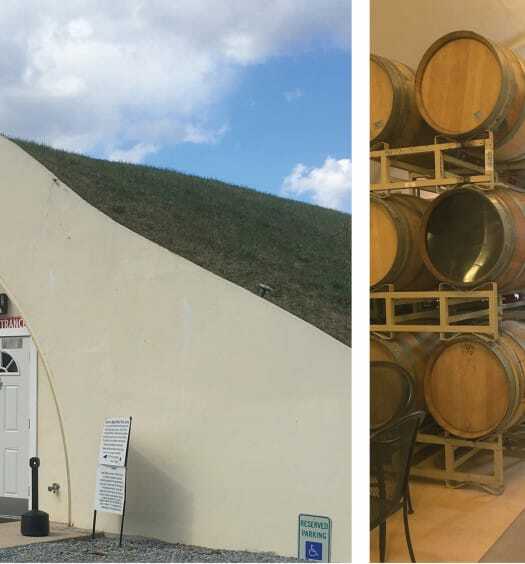 Twin Oaks Winery is .3 miles from the parking lot and offers a dog-friendly environment to enjoy a refreshing glass of wine, listen to some live music on the deck and celebrate your accomplishment. Additionally, Great Country Farms is only 3 miles away. This dog-friendly farm—even hosting a Dog Days Festival Aug. 9 & 10—offers amazing pick-your-own fruit, fun events, farm animals, family activities, music and more. Both are great post-hike destinations offering lovely settings to round out your day. Ah, Northern Virginia, your natural beauty never ceases to amaze. The A.T. provides a strenuous yet peaceful retreat within a short drive from the city. Getting There: Either take the Beltway to the toll road and then Route 7 OR take 66 to 17N to 601N. Park at the overflow lot at this intersection of Route 7 & 601 or turn left onto Route 7 and park in the main lot off Pine Grove Road. Join us! 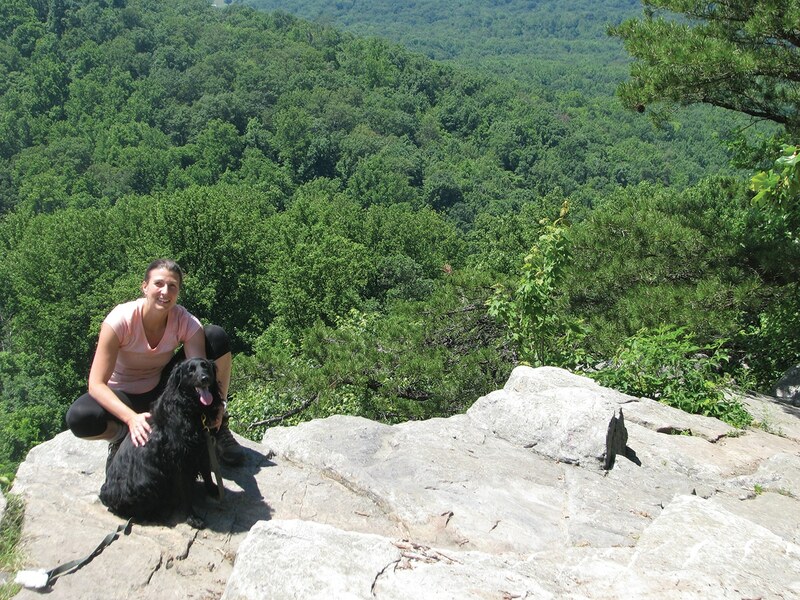 Angela Meyers, publisher of NOVADog Magazine and Pet Lovers Companion, reviewed these hikes with her dog Maggie. Join Maggie and Angela at the next NOVADog Group Hike on September 7. Watch our Facebook page for more details.